Since we opened the doors at Leopard’s Leap Vineyards, we have shared the premises and collaborated with Liam Tomlin Food. The relationship has been central to our focus on pairing great wine and food for our customers. The relationship now enters a new phase with Liam Tomlin Food relocating to Cape Town where the wonderful classes and demonstrations will be accessible to more people. 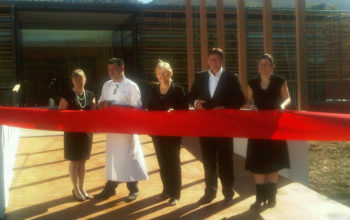 Liam’s association with Leopard’s Leap Vineyards will continue with Liam presenting cooking classes and demonstrations. In addition we will be expanding the culinary offering with some new and exciting experiences. Fans of well-known chef, Liam Tomlin and regular patrons and cooking students at his culinary studio will be delighted to hear that Liam Tomlin Food is in the process of finding a suitable venue for the Liam Tomlin Food experience in Cape Town. “It makes sense to be nearer to our main support base and although we will miss the beauty of the Franschhoek Valley and its friendly people (not to mention having wonderful wines across the room from us! ), we are also looking forward to being in the hustle and bustle of Cape Town”, says Liam. Renowned for being on-trend with all things culinary, the Liam Tomlin Food team is very excited about bringing their fresh perspective and highly-rated cooking school, popular demonstration lunches as well as culinary store to the already cooking Cape Town gastronomic scene. Leopard’s Leap Wines will continue with is exceptional wine tastings from the beautiful and contemporary Leopard’s Leap Family Vineyards venue, and while Chef Liam will still present cooking demonstrations and classes on a regular basis, there will also be another exciting food offering on the table. Co-owner of Leopard’s Leap Wines, Hein Koegelenberg, eagerly anticipates the tailor-made wine and food experience and says: “Having food-friendly wines, a state of the art demonstration kitchen and a talking-piece rotisserie to work with, our wine and culinary teams are finalising the details of a delicious and exciting food and wine lifestyle experience”. Always striving towards quality and innovation, the new edition of Leopard’s Leap Family Vineyards promises to be a highlight on the itinerary of wine and food enthusiasts visiting Franschhoek.